Pray for 9 Days. This Novena was written by St. Alphonsus of Liguori.First Day: O most amiable Lord Jesus Christ! We thank Thee for the great gift of faith and of devotion to the Holy Sacrament, which Thou didst grant to Thy beloved Teresa; we pray Thee, by Thy merits and by those of Thy faithful spouse, to grant us the gift of a lively faith, and of a fervent devotion toward the most Holy Sacrament of the altar; where Thou, O infinite Majesty! hast obliged Thyself to abide with us even to the end of the world, and wherein Thou didst so lovingly give Thy whole Self to us. O most kind Lord Jesus Christ! 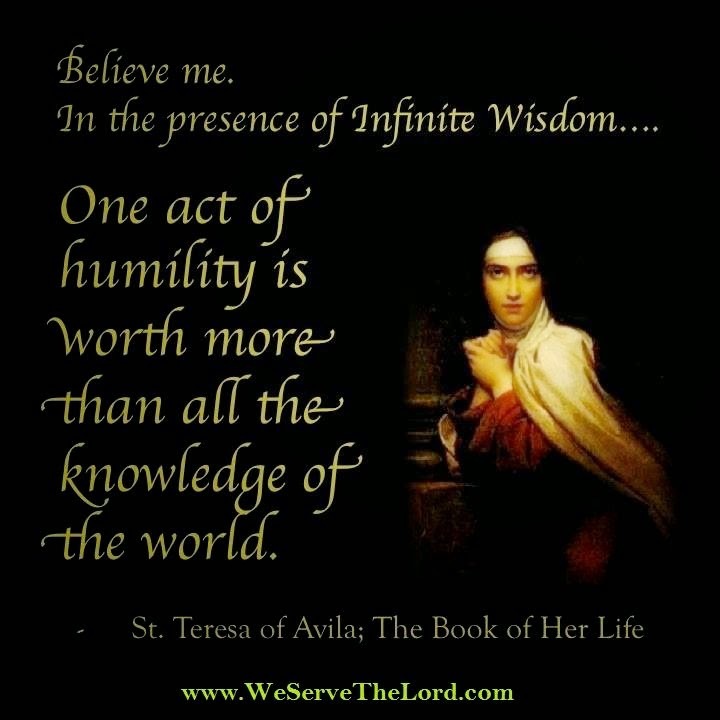 we thank Thee for the great gift of humility which Thou didst grant to Thy beloved Teresa; we pray Thee, by Thy merits, and by those of Thy most humble spouse, to grant us the grace of a true humility, which may make us ever find our joy in humiliation, and prefer contempt before every honour. O most loving Lord Jesus Christ! we thank Thee for the wonderful gift of the wound in the heart which Thou didst grant to Thy beloved Teresa; we pray Thee, by Thy merits, and by those of Thy seraphic spouse, to grant us also a like wound of love, that, henceforth, we may love Thee and give our mind to the love of nothing but Thee. O most beloved Lord Jesus Christ! we thank Thee for the eminent gift of the desire for death which Thou didst grant to Thy beloved Teresa; we pray Thee, by Thy merits, and by those of Thy most constant spouse, to grant us the grace of desiring death, in order to go and possess Thee eternally in the country of the blessed. Lastly, O dearest Lord Jesus Christ! we thank Thee for the gift of the precious death which Thou didst grant to Thy beloved Teresa, making her sweetly to die of love; we pray Thee, by Thy merits, and by those of Thy most affectionate spouse, to grant us a good death; and if we do not die of love, yet, that we may at least die burning of love for Thee, that so dying, we may be able to go and love Thee for evermore with a more perfect love in heaven. Dear wonderful Saint, model of fidelity to vows, you gladly carried a heavy cross following in the steps of Christ who chose to be crucified for us. You realized that God like a merciful Father chastises those whom he loves, which to worldlings seems silly indeed. Grant to (Name) relief from great pains if this is in line with God's plans. Amen. "O Lord, how sweet and pleasing are Thy ways!" and that we may secure the salvation of our own soul. and the intercession of Thy glorious virgin Teresa.